At the moment I am reading three books. One is For the King by Catherine Delors which I teased from last week. One of the others is Mort by Terry Pratchett which I quoted from quite extensively over the weekend, and that leaves War and Peace by Leo Tolstoy. Pierre arrived just before dinner and sat awkwardly in the middle of the drawing room, in the first armchair he happened upon, getting in everyone's way. The countess wanted to get him to talk, but he looked around naively through his spectacles, as if searching for someone, and gave monosyllabic answers to all the countess's questions. He was an inconvenience and was the only one not to notice it. The majority of the guests, knowing his story with the bear, looked curiously at this big, fat, and placid man, wondering how such a clumsy and shy fellow could perform such a stunt with a policeman. The two sentences I wanted to share from the Introduction come from page xiii. It is part of an article that Tolstoy wrote that was originally published in the Russian Archive magazine in 1868 entitled A Few Words Apropos of the Book War and Peace, and is a response to the question "What is War and Peace?" I love that second sentence - War and Peace is what the author wanted and was able to express, in the form in which it is expressed. I wonder how many authors can say that these days. There's every chance that you might see more teasers from this book over the next few weeks. Wow Marg, good luck with War and Peace. My sister blogged recently that she has been trying to read it for 18 years (she can take her copy drinking with her now that its over 18). Great teaser - thanks for sharing. My husband is reading W&P right now and loving it. Wow Marg, you're tackling a big one! I didn't think this was one I'd ever put on my TBR list, but I must say your teaser has intrigued me! Love his comment about the book, too. You must put The Madness of Lord Ian MacKenzie on your list, it was great and I've already pre-ordered the next book in the series! Lady Q, I have owned it since it first came out, and it has been beside my bed for the longest time! Hannah, so far I am enjoying it too. Livemorenow, I would love to see your sister carrying her book in the pub and giving that explanation! Josette, I am up to page 97. 1118 to go! What a brilliant quote about Tolstoy's intent for the book. That is one of those quote's that quite inspirational. ..And there was a FERAL apostrophe in my last post. That's 20 pushups for me! LOL Amanda! I was still trying to catch my breath at the thought of running 10kms to catch your feral apostrophe! I read Anna Karenina a number of years ago and I really enjoyed it! As for books I haven't read yet, Jane Austen is on that list. Gasp!! And yes, I loved that quote as soon as I read it! Kate, we will have to see how we go, but so far it is not a terribly hard read, just long! Sounds like a heavy book judging from your teaser. I don't know if I ever gonna read it. LOL Novroz! That is one of the lighter moments that is referenced there. Yeah good luck with that one!!! My teaser is at The Crowded Leaf. War and Peace was a book I read a very long time ago (in college, if that gives you an idea! ), and I don't remember this particular scene, but it's fabulous. I bought this book for myself for Christmas after noting that I didn't have a copy of one of the most famous books in history!! I am going to be reading it soon, and I loved your quotes. I do hope that you enjoy it very much! I like the image in your teaser but am still not tempted. Just the words "Russian classic" send a chill up my spine. My teaser is from Forgive My Fins by Tera Lynn Childs. Happy reading! I've been trying to read War and Peace for many, many years now. I usually start it, get about a third of the way through, and then lose all my momentum. That's happened at least three times now. Hope to finish it eventually. Interesting teaser. I hope that your enjoying your book. Here's my teaser. Great teaser! I haven't managed to read this one yet. Nice teaser. You're a far more daring soul than I for tackling this one! So we're both doing classics. This is on my need-to-get-my-hands-on list. W&P really doesn't deserve its difficult reputation. There's a thumping good story in there as well as everything else! i keep meaning to read some classics. my teasers are up . I don't know if I would ever be tempted to read this. Thanks for stopping by. That's a classic I haven't read yet. My teaser is from How to Train Your Dragon. Thanks for stopping by. Good on you for tackling it - I tried it years ago but couldn't stick with it. Here is our teaser for today! The first time I read this, I was totally too young. I didn't appreciate it until years later. Good choice! 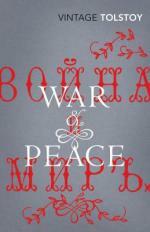 That is quite possibly the most beautiful cover of War and Peace I have ever seen! Michele, did you see the US cover I posted a few days ago. It is red and I thought that was quite nice as well. Nat, it's surprising readable, although it is early days yet. Lillie, this is my first time reading it. I can imagine though that you would get different things out of it each time you read it. I am contemplating a reread of Anna Karenina though. Reading this one has definitely put me in the mood for more. Wow, I'd heard of this book but never read it. Too afraid it might be too difficult. But both the quote and teaser sounds interesting. Ah, War and Peace. I really must get around to reading it, LOL. Your teaser makes me think I just might be able to get through it easier than I think. Good teaser!